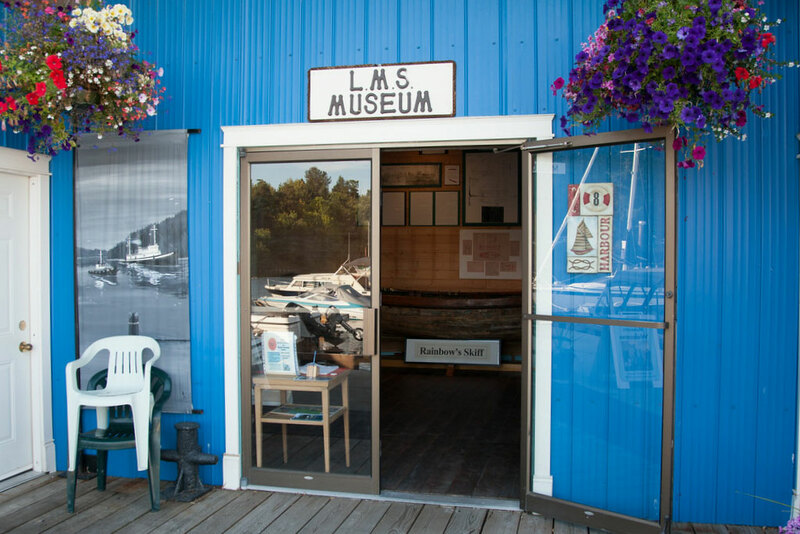 Ladysmith has a proud and interesting marine history, and the Ladysmith Maritime Society (LMS) is committed to capturing and sharing that waterfront history with our communities on both sides of the harbour and with our visitors. When LMS was established in 1985, one of its goals was to build a maritime museum. In 2007 that dream became a reality with our floating museum which shares our maritime history with authentic artifacts and nautical displays. We were honoured with a BC Heritage Award in 2008 and 2013. 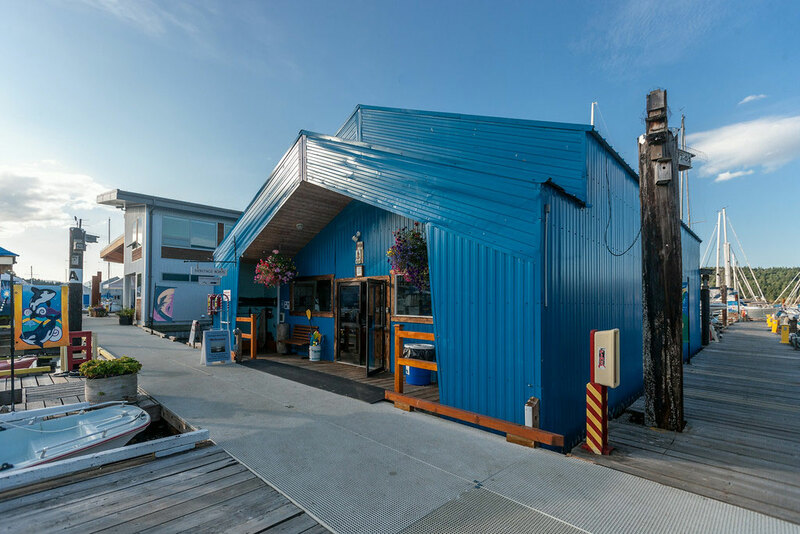 The Maritime Museum is located in a blue boat sheds on the main dock and is open daily, 10 am – 2 pm, during the warm months. 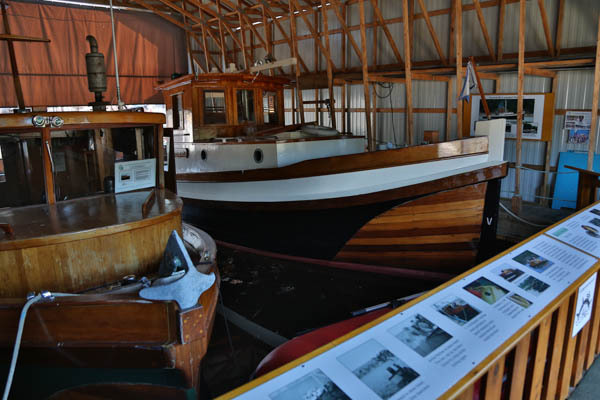 Here you’ll find interesting displays of local maritime history, marine communication and safety, shipwright tools and the Rainbow’s Skiff dinghy. We are fortunate to have two large marine radios made by Spilsbury & Tindall and Spilsbury & Hepburn. Another display shows two complete sets of shipwright tools and documents from Vancouver Island shipwrights Frederick Swift and Larry Chattel. Interesting old anchors, outboard motors, winches and other nautical artifacts bring back memories for visitors. 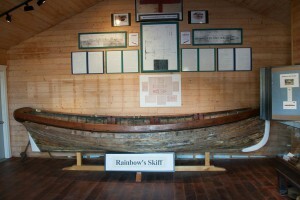 The Rainbow’s 16-foot skiff dinghy, dating back to 1898, is showcased in the Museum. This beautifully built skiff dinghy may be the last vessel remaining from the transferral of the Royal Navy base in Esquimalt to the Dominion Government in 1905. 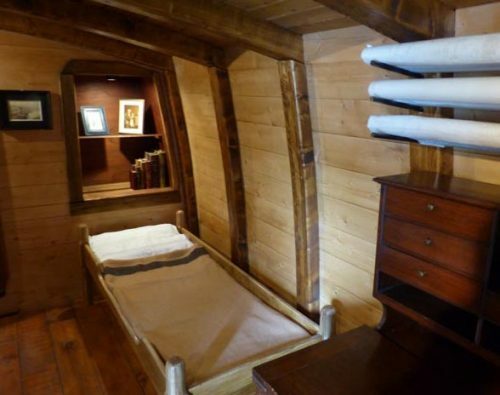 The newest Museum addition is a Captain’s Cabin, meticulously recreated by one of our invaluable & talented volunteers, complete with marine documents and books, writing desk and bed. 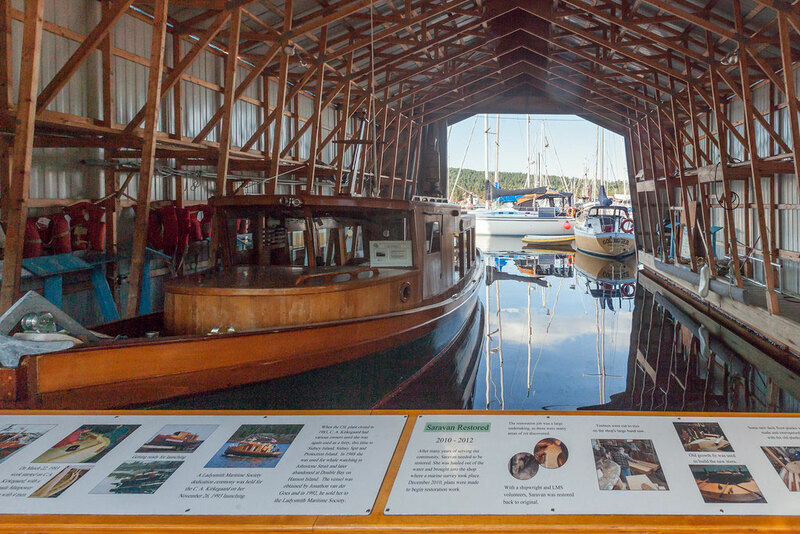 On the southeast side of the Welcome Centre, you’ll find another large blue boat shed named the Bill Adair Heritage Boathouse. Here you’ll find the Saravan, a local 1938 restored tug boat. The pictoral display shares the history of two wooden vessels that our volunteers have restored. The Bill Adair Heritage Boathouse is open daily. 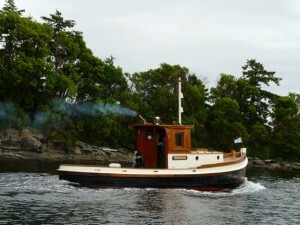 The Saravan tug boat was built in 1938 for Harry Van Froome and named for his wife, Sara. In 1988 the boat was donated to LMS by Ken Mulholland, and refurbishment by our volunteers and trainees continued until 1991. This work was made possible through government lottery funds used for training young people in restoration skills. For many years, the Saravan was used by LMS as a passenger vessel for harbour tours, however was retired in 2009 due to Transport Canada regulations that would require a refit that would alter the vessel’s authenticity. For the next two years, LMS volunteers again worked to restore the Saravan to her original glory, in time for the 2012 Ladysmith Maritime Festival (now known as the Heritage Boat Festival). Great attention was paid to historical detail, for example, obtaining and using authentic old brass from a Vancouver foundry. The shipwright and caulker, along with many volunteers, worked steadily on Saravan. Some of the work included rewiring, building a new stern, replacing planks, making new deck planks, replacing caulking, removing varnish, installing the tow post, a new bronze propeller and a host of finishing work. Come and see the Saravan’s beauty; traditional tug boat colours with her strong timbers stacked to make the stern match the power of ocean swells. C.A. 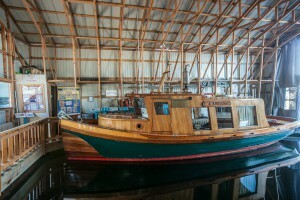 Kirkegaard was originally built as a crew boat for C.I.L., moving men from sites around the Gulf Islands. Later in her life, this boat worked as a ferry in local waters. After C.A. Kirkegaard was donated to LMS, our expert craftsmen went to work to restore her, while providing vocational training to young people through the same government program as used with the Saravan. Today, the 29 foot, C.A. Kirkegaard is back in the shop for another restoration. Come to the Boat Shop any Monday, Wednesday or Friday morning to walk and chat with the men so lovingly repairing her again. She is in good hands. 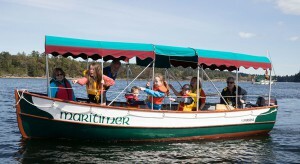 Maritimer, our tour boat, began as a lifeboat with BC Ferries and has been lovingly restored. Today it carries visitors on Harbour Tours to hear stories of our local history and culture and see wildlife living in our beautiful bay. Currently open Wednesdays from 10 am – noon, or you can arrange for a guided tour by calling Shirley at 250-245-3075. The Harbour Heritage Centre is located at 610 Oyster Bay Drive, in the south end unit of the big blue building, once a forest industry Machine Shop. 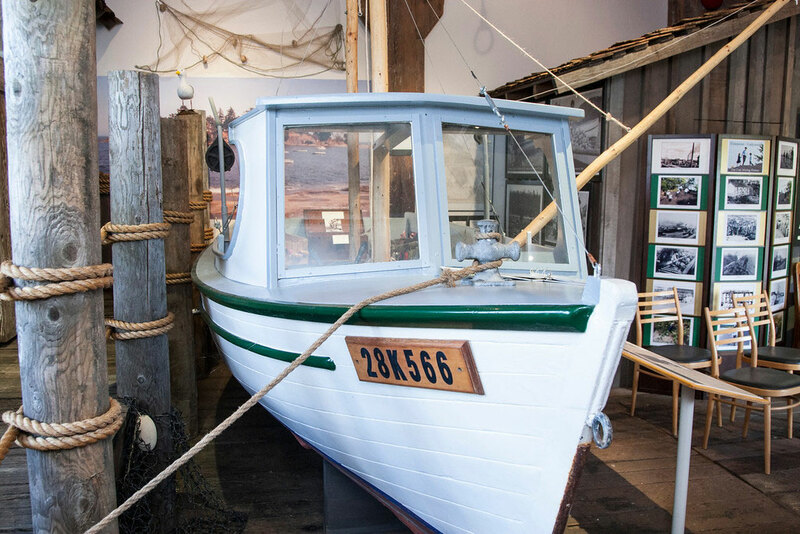 The Centre is an exploratory, interactive place where families, students, elders and tourists can discover the early way of life in Ladysmith Harbour – fishing, logging, coal and oysters. Once inside, you feel like you have stepped back to the millennia, represented by a mural of the pristine harbour, when it was home to the people of the Stz’uminus First Nation and provided them with their food and way of life. The 1900’s saw expansion of the oyster processing industry, the transfer of coal from steam locomotives which travelled along the long coal wharf to waiting ships, the old fishing dock with the Porlier Pass troller and stories of fishing at the ‘Gap’, the ore smelter in the harbour, and development of the ‘Log Dump’ where logs brought by rail were pushed into the sea for sorting and transport. 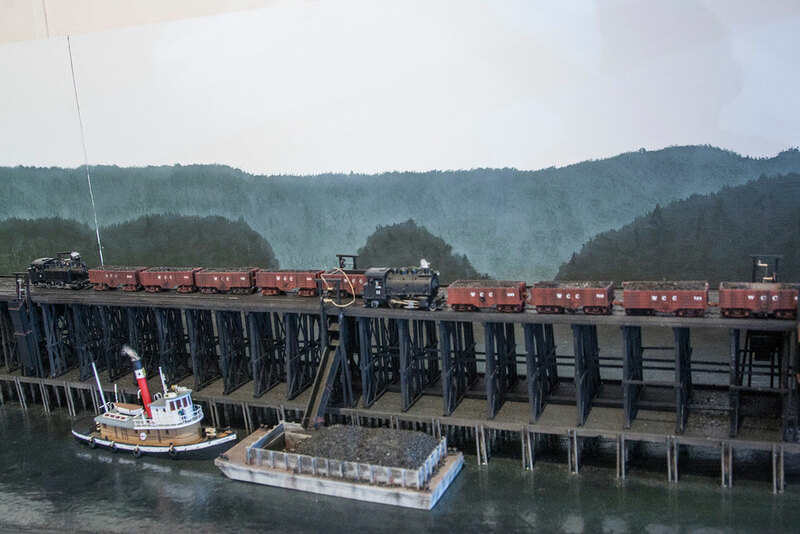 In the Centre, you’ll experience a replica fishing shack, and view scaled dioramas of coal and wharf operations during the late 1800’s and early 1900’s. The succession of industrial activity in the 1900’s provided the economic base for development of the Ladysmith community, although many of the changes have been harmful to the harbour environment and to traditional ways of life. As we move forward in a positive way, we realize that what occurred in the past has become our history. 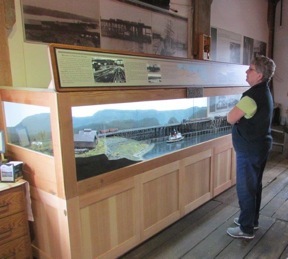 In the Harbour Heritage Centre, we provide visitors with unique waterfront experiences through our displays, legends, stories, slideshows and activities. Our purpose is to develop an understanding of our heritage and culture, build community spirit and ensure that our harbour is kept alive for future generations. After experiencing the Harbour Heritage Centre, wander along the walkway to the Waterfront Art Gallery, located upstairs at the north end of the building. 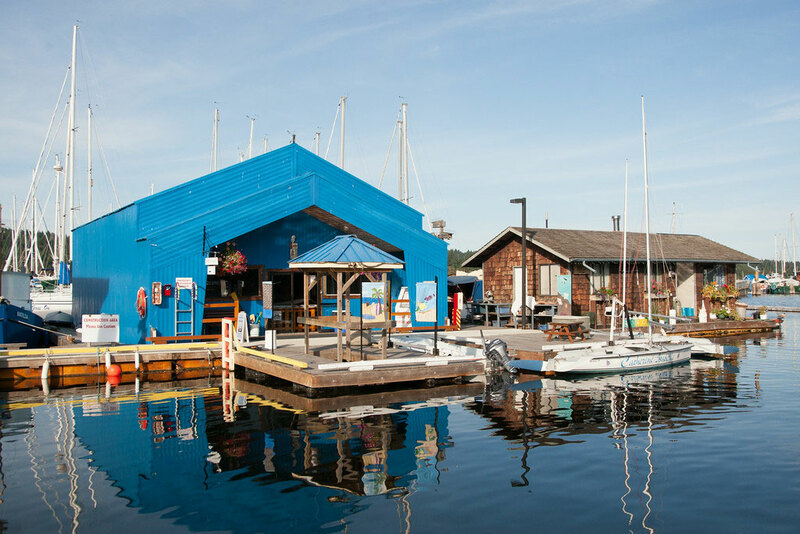 The ‘Long Wharf’ is central to the founding of Ladysmith as a community. In 1896, coal had been discovered at Extension, just south of Nanaimo. James Dunsmuir decided to build a town here where the coal could be delivered by rail, loaded onto ships and taken to world markets. ‘Long Wharf’ was built here in 1898-99. The first ship departed with its coal cargo in December 1899. The wharf remained in operation until 1931 when the Extension mine closed. 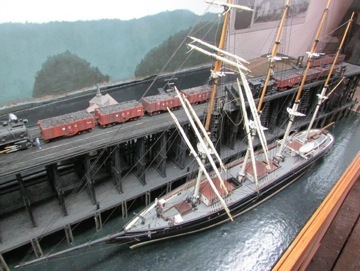 In 2009, the Ladysmith Maritime Society decided to commemorate this important history in the form of a visual 3-D diorama. 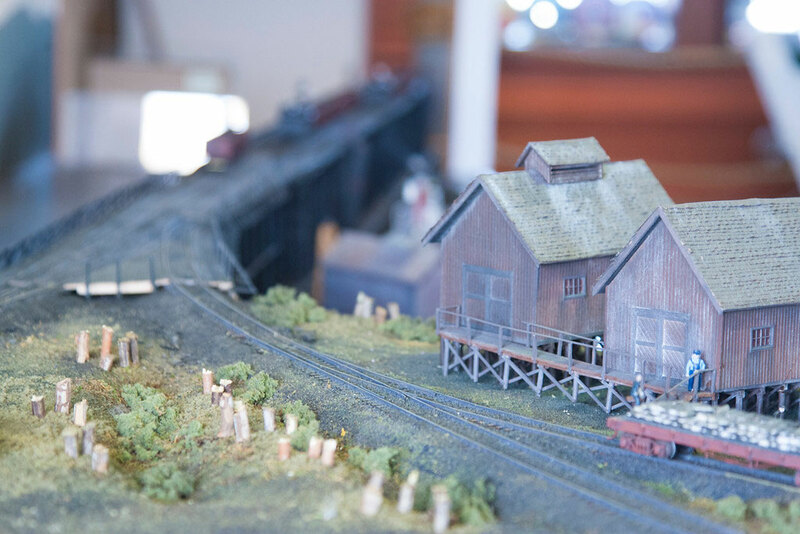 Guy Brooke, a local artist, was commissioned to create a diorama of the Ladysmith ‘Long Wharf’. Guy researched, drew up plans and began the project but, unfortunately, passed away in 2010. 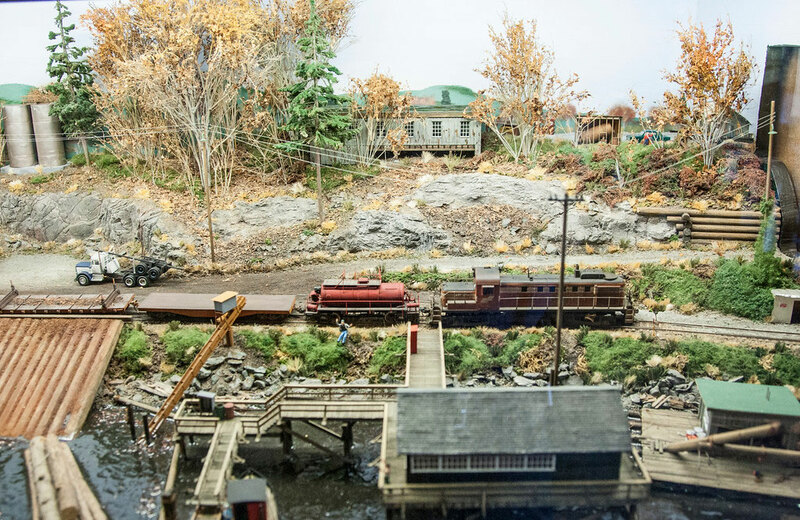 In 2013, Dave Ames saw the unfinished diorama and said his group of model railroaders would be interested in completing the project. The volunteer group including Dave Ames, Harry Southern, Ken Black, Bob Hartl, Victor Gerwin, Jim Irvine, Vies Salanski and Bill Hook began in 2013 and completed the diorama in 2014. Harry Southern documented the construction steps with his camera and shared his videos on YouTube. We are a non-profit society, committed to preserving, promoting and protecting Ladysmith’s maritime heritage. Revenues from our community marina are used to support the operation of the Maritime Museum, the Harbour Heritage Centre, and our educational and heritage vessel ambassador programs. We welcome donations in support of our work. Our location, on the water and on land, lends itself well to student field trips, community activities and tourist visits. Special interactive programs have been developed to give children and adults unique waterfront experiences that will enhance understanding of our local maritime history.